Mechanical Resistance of Visors Jig. 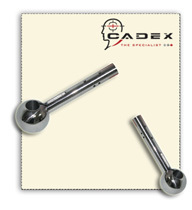 The Ball Arm is the piece that contains the accelerometer and allows the headform to rotate. 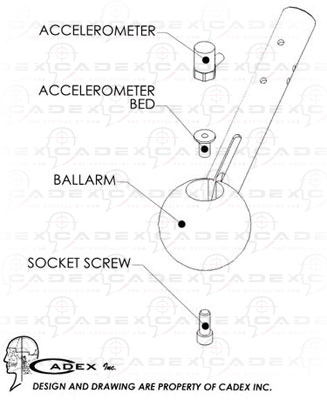 The Ball Arm is the piece that contains the accelerometer that calculates the speed of the impact. It is locked in place between the Clamp and the headform. The Ball Arm has been custom designed for our helmet testing machines. If you desire a custom design to use with another machine, please provide the following information with your order. The angularity of the arm refers to the drawing measurement C. The different angles most commonly used are 20°, 25°, 30°and 35°. The length of the arm refers to the drawing measurement A. The diameter of the arm refers to the drawing measurement B. 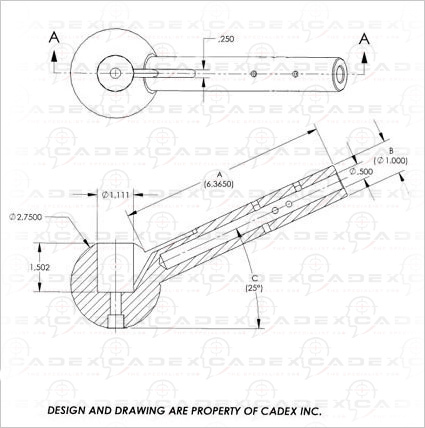 The ball arm can be made of three different types of materials to reach different weights, depending upon the configuration of your drop assembly. 4 bolts: Are used to secure the Clamp to the headform. Only 5/16 NC 18 - 1 3/4 inch length bolts should be used to avoid any damage to the tread in the head form. Accelerometer kit: Consists of the accelerometer sensor, support bed and cable. Drop Carriage / Flying arm: The drop guiding system on the machine that will maintain the headform and other parts of the drop assembly in the trajectory of the impact. Ball Arm: The Ball Arm contains the accelerometer sensor and is the moving joint connected to the headform. It allows for various positioning of the headform. Copyright © 2019 Cadex Inc. All rights reserved.